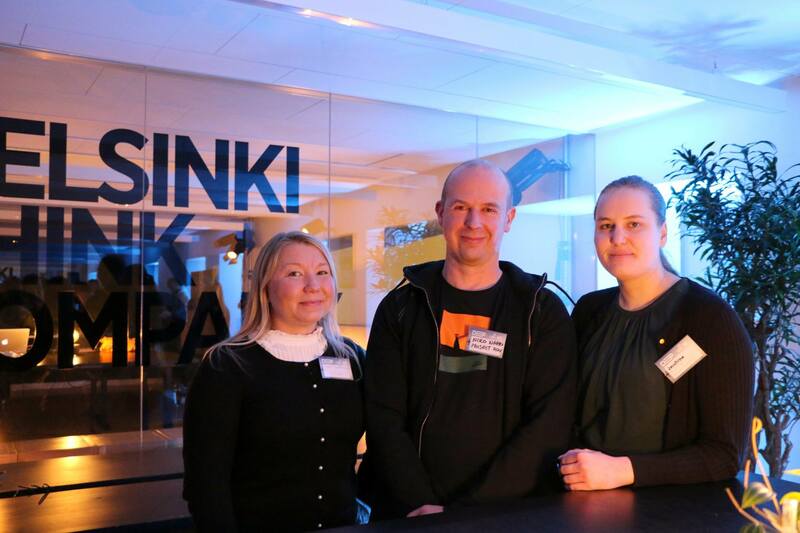 Three of the Suurisininen team members, from left Sanna Korkonen, Niko Nappu and Josefina Ruponen (photo: Helsinki Think Company). Read more about the team from the suurisininen blog post (in finnish). The first important event in my life that was related to the world underwater took place when I was a child, when my godfather brought me a book, bearing the name of Captain Cousteau, as a present. I remember where I was sitting. I remember what it felt like to read of the journey of Jacques Piccard to the Mariana Trench and back, using a submersible (a bathyscaphe) called Trieste. It made me afraid of getting caught in the jaws of a giant clam. I wondered if they existed in the Baltic Sea? 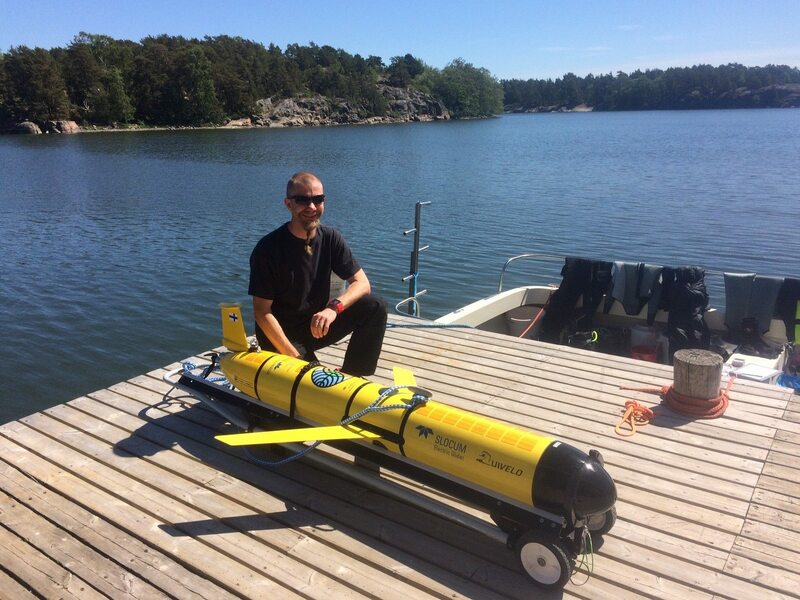 Finnish Meterological Institute’s under water glider. A melting pot of environmental sciences – OR – “Full speed at TZS”. This is how many different user groups we might have in just ONE DAY! Today there is a university course in biodiving, we have two different high schools visiting as part of their Baltic Sea curriculum, the Meteorological Institute (FMI Beta) just arrived to deploy their glider, the Metsähallitus continues their underwater mapping, this time doing archaeological work together with The Finnish Heritage Agency (Museovirasto) in the BalticRIM procjet. And tonight the research vessel Geomari from Geologian tutkimuskeskus (Geological Survey of Finland) will arrive. In addition, there are all the in-house research projects that are conducting their field sampling right now, with scientists from the University of Helsinki, University of Southern Denmark, Åbo Akademi, Yrkeshögskolan Novia – Raseborg, Monash University, Nature and Game Management Trust Finland (Luonnon- ja riistanhoitosäätiö), and probably a few others! TZS boat house and pier full of people. Sun is shining and the gear are getting dry. RESTAT staff during a picnic in Lapinsalo island in the lake Konnevesi (photo: Niko Nappu). 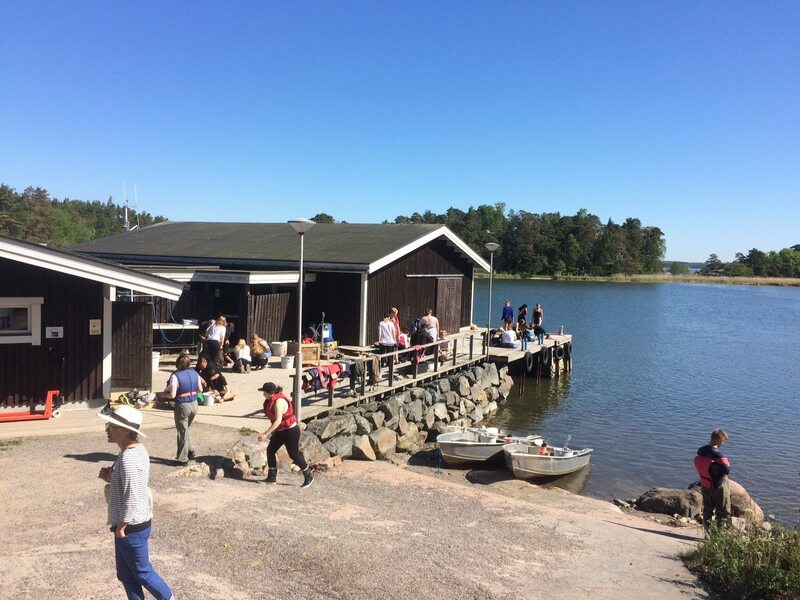 Last week staff from the university research stations in Finland (RESTAT) met for the traditional “Station Days”, this time brilliantly hosted by Konnevesi Research Station (University of Jyväskylä). These days provide an opportunity for the staff to get to know each other in a relaxed atmosphere, and to discuss common issues and joint strategies for the future. 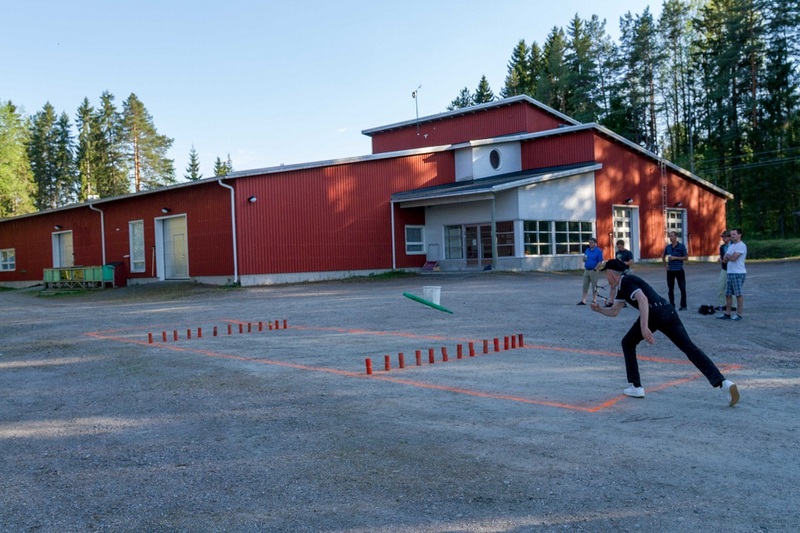 The weather favored the station days, food was excellent and everyone got the chance to show his / her skills in the traditional game from eastern Finland and Karelia “Kyykkä” (Finnish skittles). I can’t recall whether the official Kyykkä-champion was ever announced; the ever changing teams and our peculiar ranking system made it fun though. Team Tvärminne competing for the RESTAT championship in Kyykkä (photo: Niko Nappu). 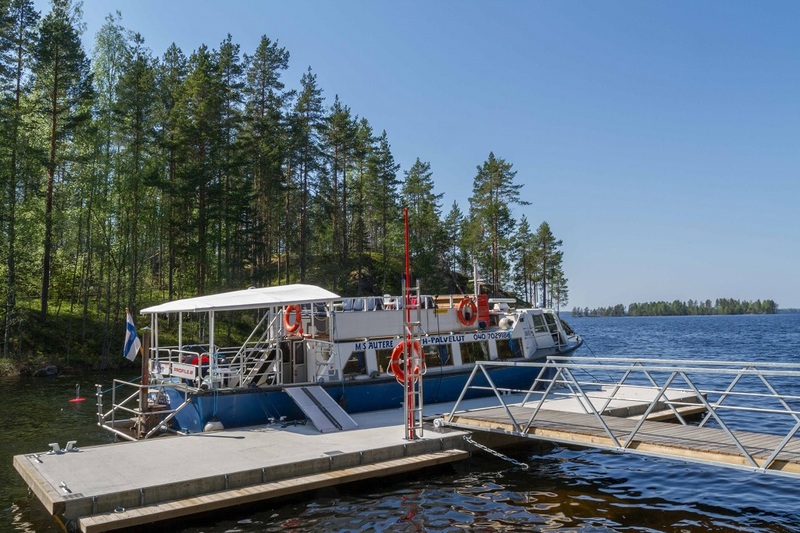 The next station days will be hosted by Hyytiälä forestry field station. They don’t have so nice lake side cruise possibilities than Konnevesi station, but there is no doubt in my mind that they will do their very best in organizing the next meeting! Turku borne cruise ship “M/S Autere” now sailing in the lake Konnevesi (photo: Niko Nappu). 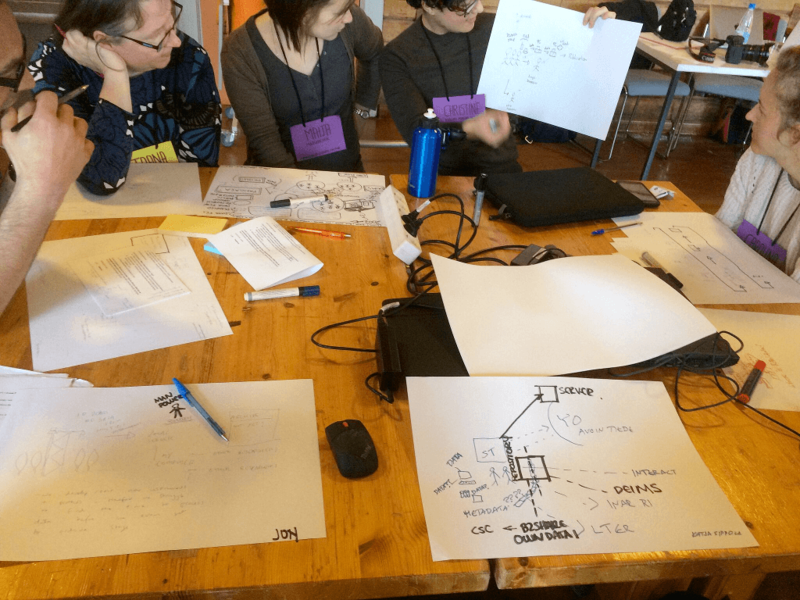 Workshopping with data management plans (photo: Andrea Botero). 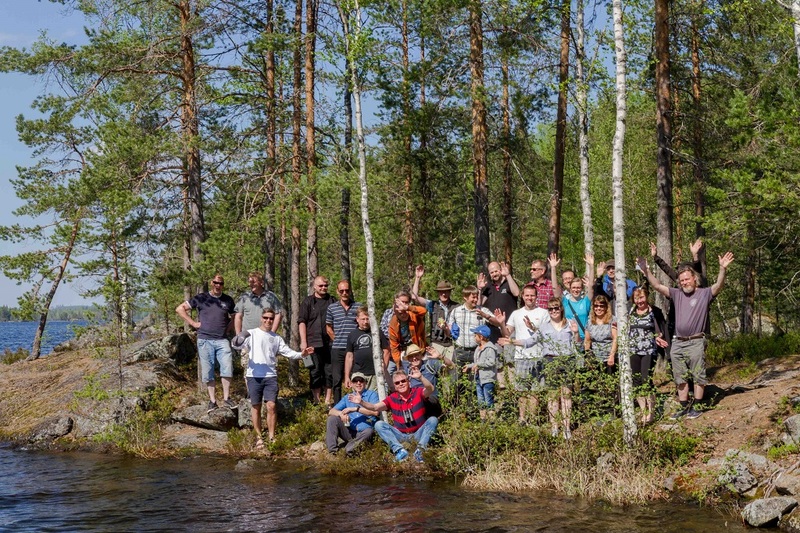 INAR RI Ecosystems organised together with MULTICS-project from University of Oulu a data management workshop in Hyytiälä 26th-27th of April. The workshop, titled “Little data, big data, no data ­̶ Local data management in the era of Research Infrastructures” The workshop introduced local data management issues in the ecological and related scientific fields as well as its place within the emerging larger data landscape. About 30 participants from Finnish and Estonian Universities and Research institutes gathered in Hyytiälä to discuss, learn and share experiences on data management from station to national scale. The researcher of the Multics project have studied data management of various units including ours during many years, and they provided excellent facilitation for the workshop. International speakers Karen Baker (Multics), Johannes Peterseil (Umweltbundesamt GmbH) and Sue Rennie, (Centre for Ecology & Hydrology, UK) brought perspectives of what data management is and how does is look like, of how data management is coordinated in monitoring network in UK and of influence of European level infrastructure development. In addition, we heard small presentations by participants giving examples of the current state and future plans and needs of data management at sites, research groups and projects. The problems that a data manager, or the person who finds her/himself as the one responsible of it (a data manager is not always clearly nominated) can encounter have a wide range. For example, it is not clear what to do with samples or data that no one knows anymore what it is (retired researchers and their collections). Also, research station know their routine measurements, but how to make the researchers tell what other measurement they are doing. Data will be the key issue for tomorrow´s researchers. 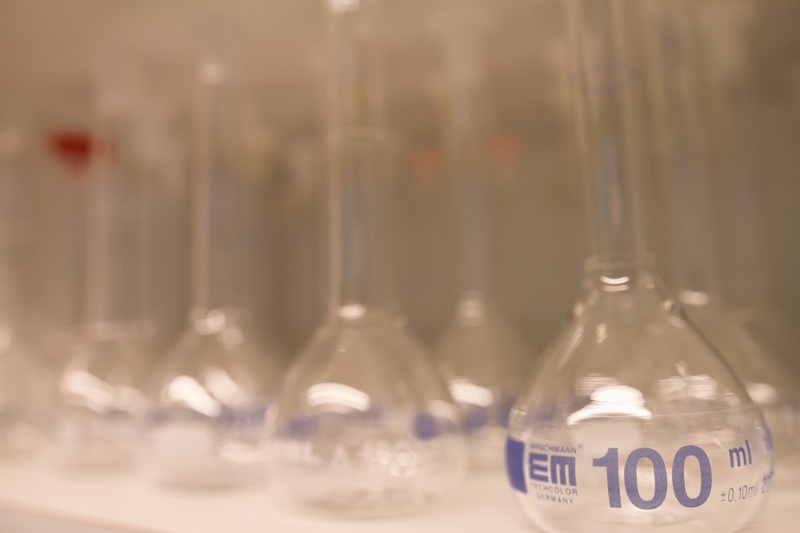 We need to make sure that the valuable, publicly funded data on the research sites are made available and the credits of its utilization goes to the right place. The data management starts from the sites but is reflected far. We, all the researchers and data management need to understand that data without a proper metadata has no value. 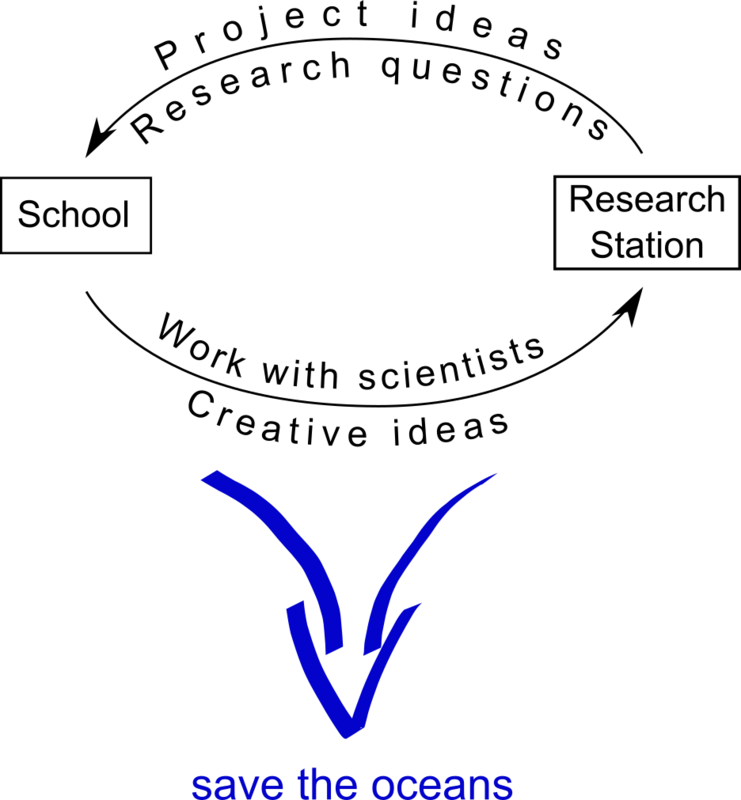 The minimum requirement related to data management considers the metadata. We need to know what is studied and where, what kind of data is available. It is important to keep discussing on the data management issues to spread the information and help everyone to understand that it is not a must to be avoid but a significant and crucial part of research. The workshop was successful. It was great to see the willingness to participate actively in discussions and the positive approach that participants have towards improving and developing the data management plans and strategies. The workshop can be seen as a good starting point for continuing the work together, and concrete steps forward were already planned. They include: 1) DEIMS inputs from new sites (and updating the old ones), 2) data management plans on the next RESTAT meeting agenda, and 3) building INAR RI Ecosystems metadata catalogue. We will also start a new email list, so that interested people can continue to receive and give peer support in the data management topics. Let us know, if you would like to join the list. Photo: Caine Delacy, Ocean First Education. A lot of different things are done and could be done at the research stations. In this post we show how the stations could be part in the school world and the fostering of the next generation. 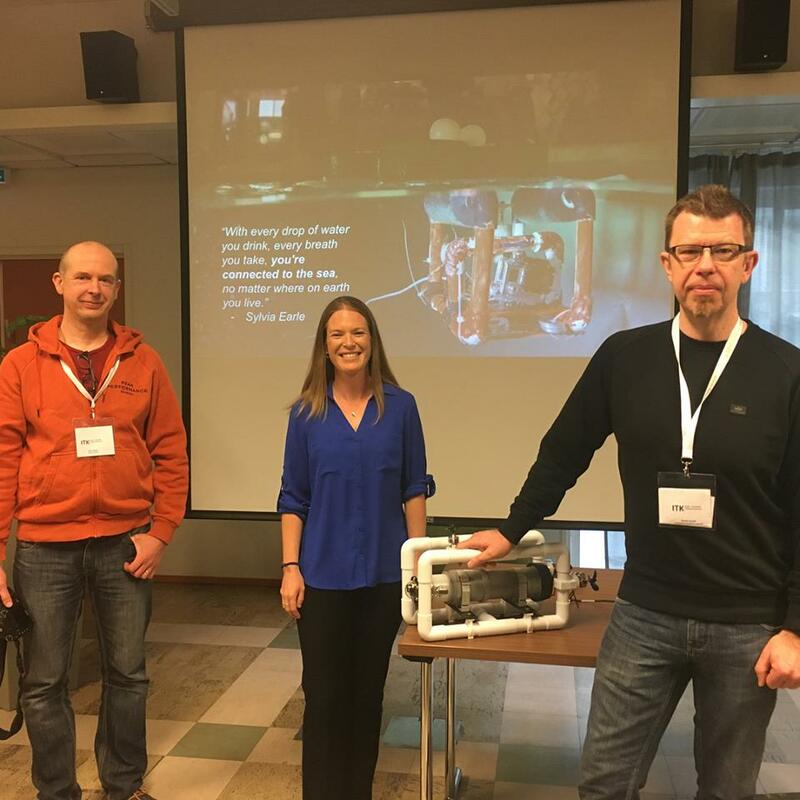 Andrea Schmuttermair, Kimmo Karell and Niko Nappu presented their project of building ROV’s in schools at ITK 2018-seminar. Knowledge related to science, technology, engineering, arts and maths (STEAM) is crucial in responding to the challenges we are facing as a society. Remotely Operated Vehicle (ROV) or under water robot is a standard tool in marine industry. They have been used quite extensively in marine sciences. We want to take the building of ROV’s to schools and use them in cooperation with scientists at the biological field stations. 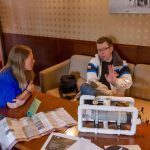 Project ROV is a global initiative to combine phenomenon-based learning with STEAM components to create collaborative, multidisciplinary, inquiry-based STEAM projects, designed by students. 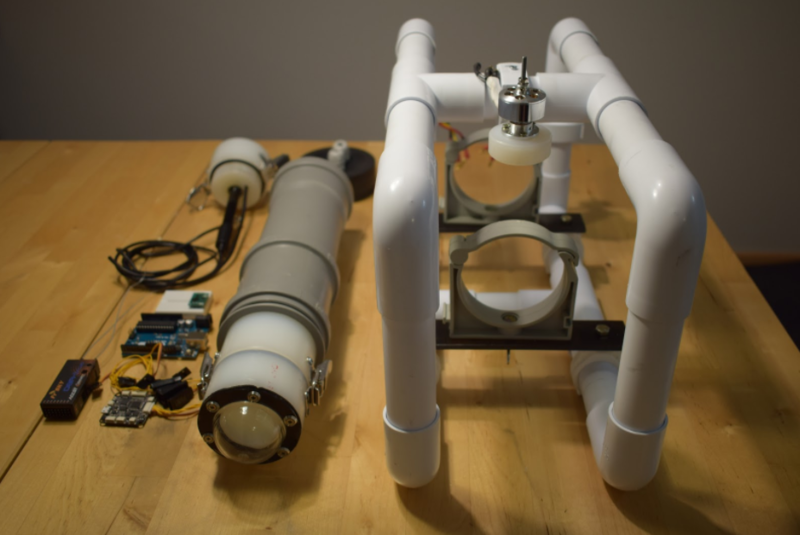 During the project, inexpensive ROVs are built at schools and used to study a scientific hypothesis formed by the students and assisted by scientists. 21st century skills, inquiry based teaching and STEAM-teaching (Science, Technology, Mathematics, Arts, Science) are essential tools in this project. 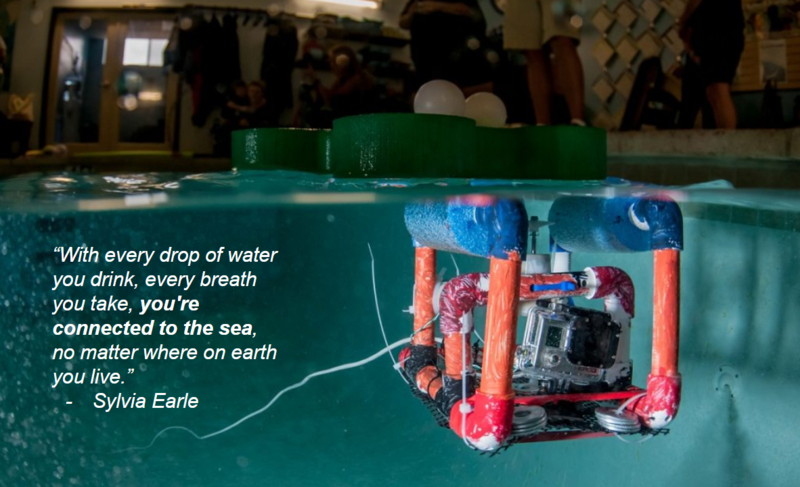 The goals of Project ROV are: 1) Encourage questioning, critical thinking and problem solving 2) Engage students around the world in underwater research, creating citizen scientists 3) Create a culture of “makers” 4) Inspire students at a younger age to pursue STEAM educational paths and careers 5) Build global collaboration and awareness 6) Encourage local community and school collaboration. There are several schools and teachers involved in the project in Finland, Germany and USA. The project will: 1) Create global collaboration for something that connects everyone on earth: the ocean 2) Raise awareness for the United Nation’s sustainable development goal of conservation and sustainable use of oceans, seas, and marine resources. 3) Encourage local area research and knowledge and create a better understanding of our local oceans, seas and underwater environments. Engaging children in science will lay the foundation for skills needed in the future in many ways. In addition to learning technology, the children will learn cooperation, collaboration and communication skills, programming and logical thinking, engineering, biology and scientific thinking. 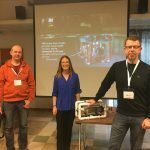 Project ROV at the ITK 2018 -seminar. People from left to right: Niko Nappu, Andrea Schmuttermair and Kimmo Karell. 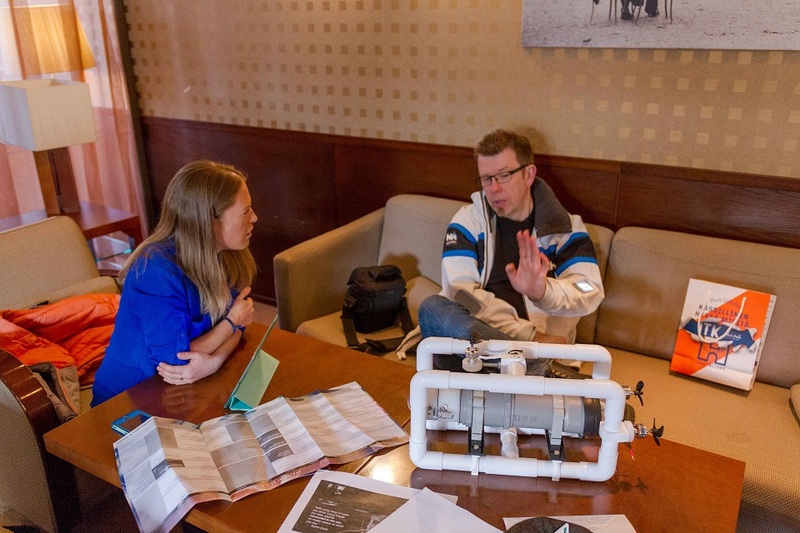 Andrea Schmuttermair and Kimmo Karell discussing about ROV’s and the presentation. 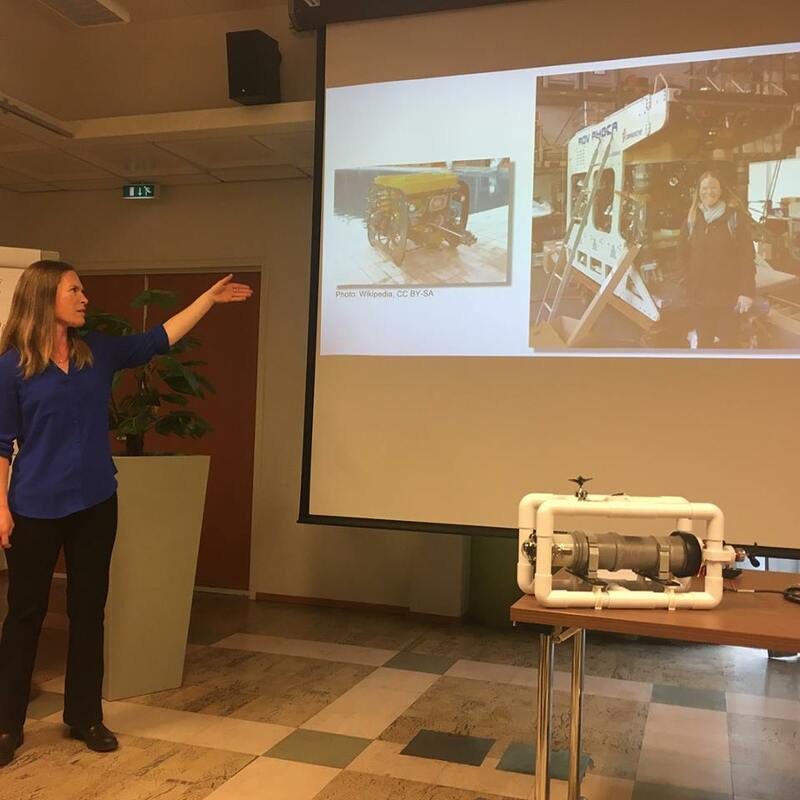 Andrea Schmuttermair telling about ROV’s. The prototype of a school build developed in the project in Itäkeskus Comprehensive School by Kimmo Karell and his students (9th grade) (photo: Kimmo Karell). 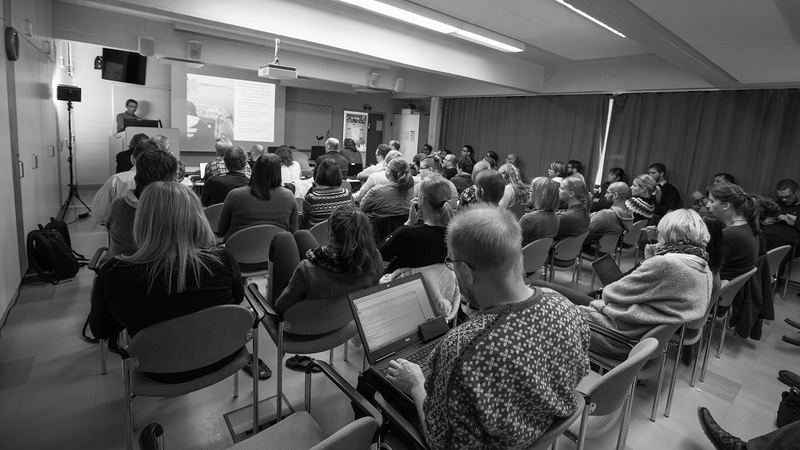 Last February took place at the Tvärminne Zoological Station the third edition of the Finmari researcher days. 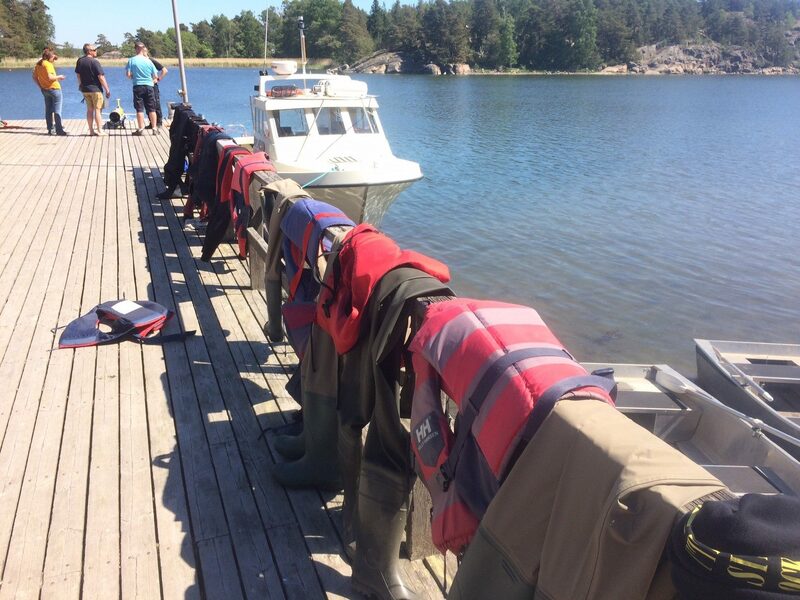 Finmari stands for Finnish Marine Research Infrastructure and it is a distributed infrastructure network of field stations, research vessels and multi-purpose icebreakers, laboratory facilities, ferryboxes, fixed measurement platforms and buoys of the Finnish marine research community. 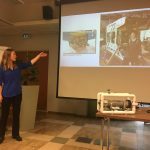 Over two days, marine researchers presented their work with subjects ranging from plastic and noise pollution to climate change and biodiversity. In the context of the newly launched communication project about the Finnish research stations (#tietaajarakastaa), the talks could be recorded in video. 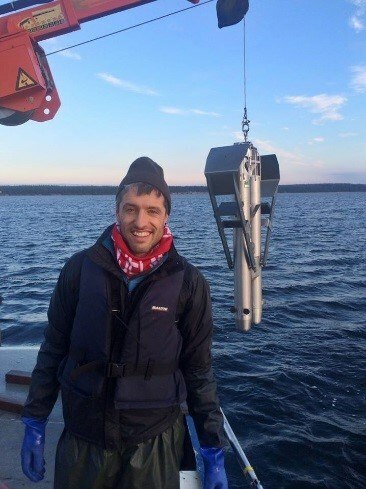 In this post you can see the first video, featuring researcher Pinja Näkki from SYKE, about the fate of microplastics in marine sediments. The rest of the talks will be available here. 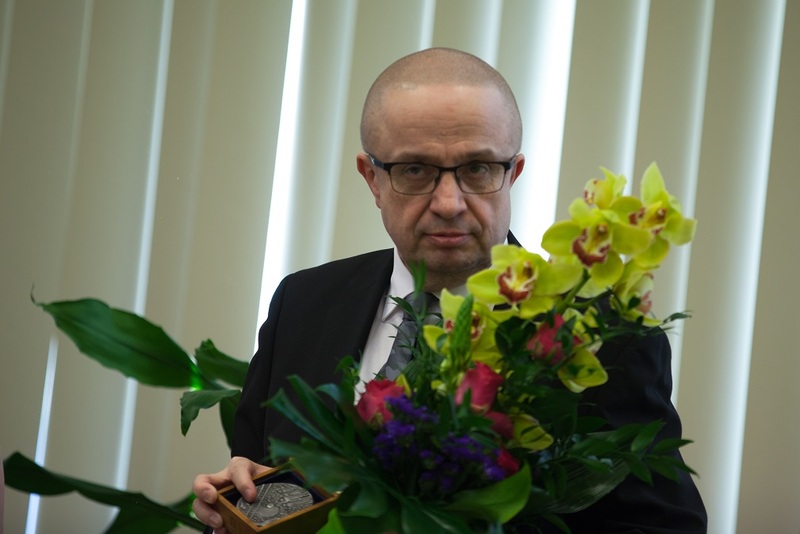 The municipality of Juupajoki has granted the 13th Juupajoki medal to academy professor Markku Kulmala. The medal was granted already in 6th of December 2017 but was handed over last Wednesday 7th of March in ceremony at Juupajoki town hall. Academy professor Markku Kulmala (photo: J. M. Cano). Academy professor Kulmala has had a profounding role in designing and building the SMEAR-station network (Station for Measuring Ecosystem Atmosphere relations). In addition to Finland’s four SMEAR-stations there is one in Estonia and one in China, Nanjing. The biggest and oldest of the stations is SMEAR 2 in Hyytiälä Forestry Field Station. The work done by Markku Kulmala and his research team is of paramount importance for the global climate change research! He has been working in Hyytiälä since the middle of 1980’s and the SMEAR 2 was founded in 1996. 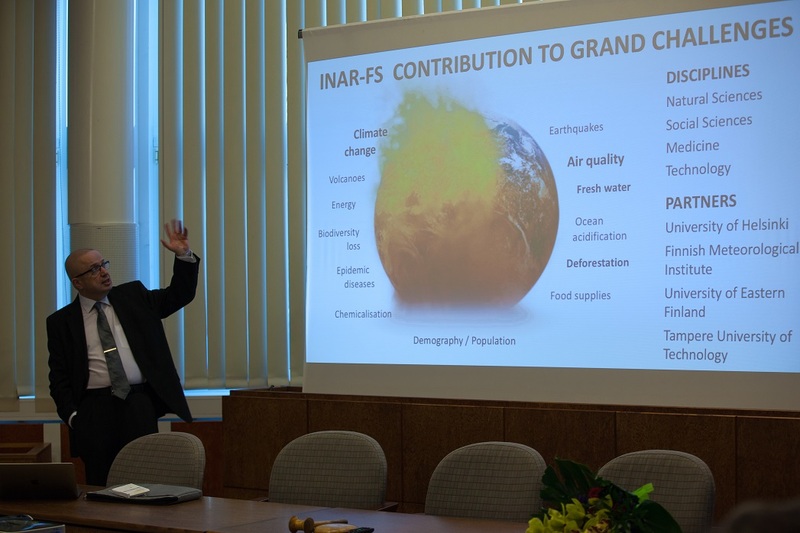 Academy professor Markku Kulmala is the leading researcher of physics and chemistry of atmospheric aerosols and the most cited researcher in geosciences. He is one of the founders of the discipline of ecosystem-atmosphere interactions. His research groups work has increased vastly our knowledge about the mechanisms behind the global climate change. Markku Kulmala giving a lecture at Juupajoki town hall (photo: J. M. Cano). Juupajoki medal is designed by Anssi Madetkivi in 1983 and it is the highest mark of honour from the municipality of Juupajoki. The medal can be granted as a recognition for the work or act done for the municipality. Hyytiälä Forestry Field Station is an active field center of multidisclipinary research on forests, peatlands and atmosphere. A central topic is the role of forests and peatlands in climate change, which is a complex issue as the forests and peatlands act both as a source and a sink of greenhouse-gases and are also gradually becoming a more important source of bioenergy for the society. Biosphere – aerosol – cloud – climate interactions. Analysis of gaseous and particle pollutants and their role in cloud formation. Analysis of environment and tree structure on gas exchange, water transport and growth of trees. Hyytiälä intro, short version from RESTAT UHEL on Vimeo. K), operationally defined by filtration at 0.45 µm, June 2015. White circles represent sampling positions (vertical depth resolution = 5 m). controlling Fepart along the salinity transect are indicated by the grey bars (T. Jilbert et al. 2018: Impacts of flocculation on the diagenesis of iron). NEW PAPER! Coastal ecosystems of the Baltic Sea are strongly influenced by inputs of material from rivers. Eutrophication and climate change are altering these inputs, hence there is an urgent need to understand the natural cycling of terrestrial material in estuaries. In a new open access paper in Biogeosciences, Tom Jilbert and colleagues from the Aquatic Biogeochemistry Research Unit (ABRU) studied the effect of riverine inputs of iron on sediment microbial processes in Pojo Bay, an estuary close to TZS. Sediments host rich microbial communities that carry out key ecosystem functions such as the breakdown of organic matter and recycling of nutrients. Because many microbes use iron in their metabolism, the natural input of iron minerals from rivers may be important in regulating the microbial functioning of coastal sediments. 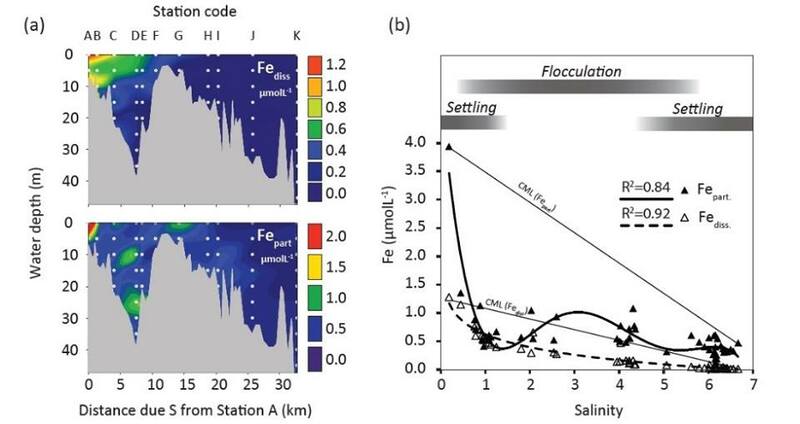 Tom’s work shows that dissolved iron in river water precipitates in the estuarine environment via a process known as flocculation, leading to higher rates of microbial iron utilization in nearshore areas. The abundance of iron in coastal sediments could have knock-on effects for other sedimentary processes, including carbon burial and the production of methane. Tom Jilbert with the bottom sampler. I left a small town in Alabama in the United States in June of 2017 and moved straight to the Lammi Biological Station. I immediately felt straight home living in the country side and it was an amazing place to experience Finland while the days are very long. I currently work in the Evolution, Conservation, and Genomics Research group under the supervision of Dr. Craig Primmer at the University of Helsinki. We now have a fish rearing facility at the station. It consists of 32 tanks in total and will all be filled with Atlantic salmon alevins in the following weeks. These fish will remain in the tanks for several years and will be part of many experiments with multiple members of our research group. I was able to live at the station for over 5 months but have now moved to Helsinki to be able to work at the Viikki campus. Living at the station was quite the experience for me. It is a bit isolated and when you are a foreigner (like me), you probably do not have a car. However, I enjoyed every day I lived here. There are many trails to hike and a sauna right on the lake. The station staff are all excellent. There is a constant influx of professors, researchers, and students so it is easy to meet new people and be exposed to different projects and areas of science. The station has an amazing welcoming environment and was the perfect first place to live in Finland. The editor in chief of this blog is the coordinator of the HiLIFE -research stations. Comments and contribution suggestions should be addressed to niko.nappu AT helsinki.fi. The stations’ www-page is here.